Oh boy, it's time for summer vacations! 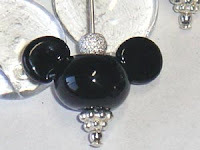 Be sure to score some Minnie Glam, Mickey Ears, and Minnie Party Dress earrings at www.RockerJewlz.com for your Disney visits. I'm keeping busy updating the website, finishing up jewelry for a charity auction and making calls to set up appointments to show my work at stores on the Central Coast (of CA) next week. We'll see how many of them feel my jewelry would be a good addition to their current stock. After that it's home for the fourth of July and then a week off with family. I'll move into high gear next to design some autumn pieces and plan on what to purchase to fill your holiday needs. In between all this, will the vacuuming and dusting occur? Hmmmmm.....ha! 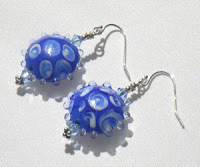 Little handmade glass bluebells are on their way to the studio. It's going to be fun to make one final piece for spring even though we're nearly at the end of the season. Since they are blue, they could sneak their way through summer too. Don't miss my "Coming Attractions" page on www.RockerJewlz.com. My stay in Napa is going great, although today was just incredibly hot. I heard it was this way all over the bay area, so I wasn't alone. I visited shops in Napa valley and found several that do not carry lampwork. It was exciting to find no lampwork because that either means it is either unknown or unwanted in the area. You KNOW I'm voting for unknown. I thought objectively and believe my jewelry would be a perfect addition in several of the stores based on the style of apparel available. Now I just need to gently convince the buyers they need my goods! Wish me luck. 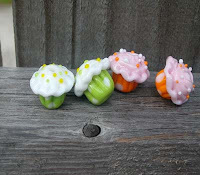 I couldn't resist this photo...I mean, who doesn't like to look at tiny, handmade glass cupcakes??? They are on their way to my studio. Be safe, little cakes. The shop owner that placed a large custom order is out of town next week so I have extra time to work on the jewelry...nice treat since I was aiming to mail them this weekend. It's always nice to take the pressure off a deadline. I'll be in Napa again next week, but with my portable business, you'll never even miss me! I can carry on no matter where I go...unless, of course, it's out in the wilderness...you know...no wireless network for the laptop...ha ha. To www.RockerJewlz.com I added a few photos on the "Coming Attractions" and "Currently in Production" pages so you can see what I'm working on and the beads whose arrival I breathlessly await. Lots of changes today at www.RockerJewlz.com. New earrings and pendant necklaces are available and photos have been added to the Walk of Fame gallery. The featured earrings (left) are "Bonnie Blues" which I named after the bead artist, Bonnie Roof. These beads are very cool...kind of a controlled outer space look that are a little wild, but not too much. My excitement is starting to build on the custom necklace I'm making in black, white and yellow. I've found that the anticipation has to build for 2 or 3 days and then I can whip out a new piece of jewelry. If I start too soon, I just get frustrated because I wasn't really ready. It took me a while to figure THAT out. So, I'm enjoying the anticipation. Now if I could just do that with weight loss, I'd have it made! 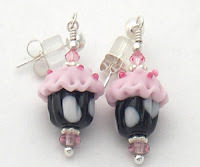 Finally, I have photos of the "Paris Chic" (left) and "Party Hat" cupcake earrings whose beads were previously displayed on my "Currently in Production" page. The other new earrings you'll see are "Bonnie Blues", "Batik Blue" and "Batik Black", "Black Starstuds", "Angie's Special" and "Crystal Drops" that come in just about any Swarovski crystal color out there. I'm working to complete my custom store order by the end of this week and in the mean time I'm cleaning up www.RockerJewlz.com and moving some of the pieces marked "sold" over to the Walk of Fame photo gallery. Need to lighten the pages some so you don't keep seein' the same old same old.